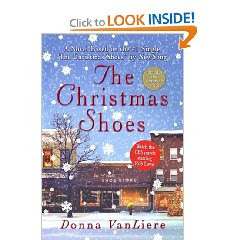 The Christmas Shoes by Donna VanLiere is a novel that was written based on the song of the same name by NewSong. This is a touching novel about people discovering the real meaning of Christmas. The novel moves between two stories. One is told from the perspective of a lawyer who has been focused on moving up in his career and accumulating material objects to make his family happy. But he's about to lose them because he never makes time to be with them. The other story is about a poor boy that is losing his mother to cancer. The two stories intertwine into a wonderful, short read for the holiday season. I have a gently used, hardcover copy of this book that I'd like to give away to a follower of My Book Retreat. If you're already a follower, just write a comment below letting me know. If you're not a follower yet, please become a follower and leave a comment below. Because I'd like to get this out to the winner before Christmas, I'll only keep this giveaway open until Friday, December 4th, at midnight Eastern time. Good luck! And thanks for following my blog! I am a follower and would love to be entered into this giveaway! I'm a follower...looks like a great book! Thanks for the giveaway! I hate to hear this song when I am driving...it is difficult enough to drive under normal conditions, but with tears streaming down your face, impossible!! Still, it is one of my favorite Christmas songs. I would love to win this book. Oh, I am a new follower, Google #7!! assuming this is open internationally. i m a new follower..
love the Christmas theme books! I'm a follower have since day 1 :) love reading about what books your reading! Great story (no need to enter me), but it is a wonderful book.